Could a 15-inch MacBook Air be on its way? If you're in need of a lightweight 15-inch notebook, Apple might soon have you covered. Rumors have surfaced that Tim Cook's team is planning to ditch the 11-inch MacBook Air in favor of a larger format laptop. The rumor, which comes via a Chinese news site, says Apple will be keeping the 13-inch MacBook Air models, but it will ditch the 11-inch version in order to clear a path for the 12.9-inch iPad Pro, according to the news outlet's sources. Additionally, the next-generation MacBook Air is rumored to feature Intel Skylake processors, a Retina display, a new battery pack and cooling modules. What's in the MacBook Air? Today's MacBook Air models come in an 11-inch model starting at $899 (£749, AUS$1,249) and a $999 (£849, AU$1,399) 13-inch variant. Both models come standard with a 1.6GHz Intel Core i5 processor, Intel HD Graphics 6000, 4GB of memory and an 128GB SSD. The 13-inch MacBook Air comes with 1,400 x 900 resolution screen, and the 11-inch version comes with a 1,366 x 768 screen. If the 2016 version of the MacBook is updated to a Retina display, the 15-inch version will feature a 2,880 x 1,800 resolution, and the 13.3-inch model will come with a 2,560 x 1,600 resolution. Apple has gone out of its way to market the iPad Pro as a productivity device that can replace your laptop. Given its dimensions and light weight, it's likely Apple views the iPad Pro and the 11-inch MacBook Air as direct competitors. 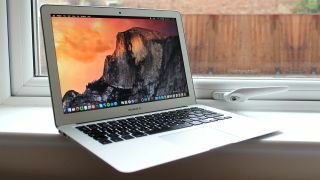 Rather than produce two devices with similar target demographics, Apple could launch the 15-inch MacBook Air in order to capitalize on notebook users who require large-format screen real estate, but don't need the premium features included in the high-end MacBook Pro. What is the best laptop in the world?